Do you own an adorable Beagle? Are you curious as to what you should be feeding them? Well you have come to the right place! Keep reading to learn all about Beagle food. The following information on Beagle food is just a guide. If you have any serious concerns or are really confused about what you should be feeding your Beagle, then you should consult your local vet. They will be able to provide expert advice based on your Beagles weight and age. A Beagle should be fed three quarters to one and half cups of dry food every day. However this should be divided into two separate meals. Remember – this is just a guide – it also depends on the size of your Beagle, the age of your Beagle and how much exercise they do. Beagle puppies will be fed differently than older Beagles. Ask your local pet store or vet for advice on what Beagle food you should be feeding your puppy. It’s important to buy high quality Beagle food. 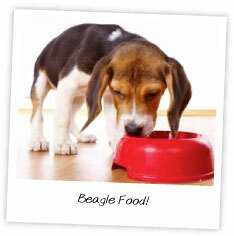 Higher quality Beagle food will have more nutrients which will benefit your Beagles health. As previous mentioned Beagles will eat anything in site. Therefore it’s important to put all food safely away if you own a Beagle. This also includes keeping a firm lid on your rubbish bin so your Beagle can’t have a rummage. If you do this then you will lessen the chance of your Beagle eating the wrong types of food. It will also lessen the chance of your Beagle becoming obese. Chewing bones or special Beagle chew biscuits is really good for your Beagles teeth and gums. You should give your Beagle a small bone or chew biscuit every second day. Giving your Beagle a bone is a great way to keep them entertained when you leave them at home on their own. If you own a Beagle, it’s vital that you don’t leave chocolate sitting around. Chocolate is toxic for dogs so to protect your Beagle make sure you leave all chocolate in places that your Beagle can’t access. Beagles are known to just eat and eat and eat and won’t stop. To prevent this, it’s best you don’t leave their food out for them all day. Once your Beagle has finished their meal, take away their bowl so they know that mealtime is over. When training your Beagle, try and use positive words and cuddles as rewards instead of treats. However, if these rewards do not work then you may need to try treats as a last resort. If this is the case then make sure you choose small treats over bigger ones. Along with Beagle food, it’s also important to make sure your Beagle has enough water. Your Beagle can get very sick if they become dehydrated. So keep an eye on your Beagles water bowl and always make sure it is nice and full. As mentioned above – Beagles love food! Therefore it’s vital you take the above advice and monitor your Beagles food intake. If you do this, your Beagle should live a long, happy and healthy life.